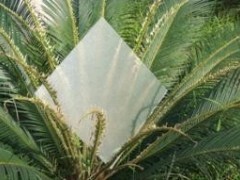 solar tempered glass is aloways used as the solar panel ,the thickness is 3.2mm. 1. The mechanical strength redoubled 4-5 times strength than ordinary annealed glass. 2. Breakage hurts reduced: when breakage occurs, the tempered glass disintegrates into countless even small obtuse fragments, which reduces its hurts to human body. 3. It can withstand a very wide range of rapid temperature changing with the endurance of 200-300℃. It is widely used for glass door, buildings, exhibiton cabin etc.